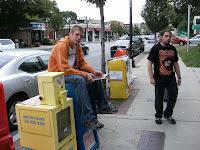 Followers of Lyndon LaRouche were outside the Brighton Center post office on Washington Street this afternoon protesting against President Barack Obama. 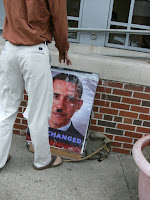 With the requisite poster of Obama sporting a Hitler mustache, natch. A post office employee was trying, unsuccessfully, to get them to stay on the public sidewalk instead of on the post office's property. I spoke to one of the two protesters, but he didn't want to say anything other than, "Obama does not care about you." Suffolk County has received $441 per capita in federal stimulus funding to date, according to an analysis by ProPublica.org. In Massachusetts, only Nantucket County received more direct funding per capita. Some of the expenditures in Allston-Brighton include: $592 thousand for Section 8 housing assistance payments to B'nai Brith's Covenant House in Brighton; $1.489 million to Charlesview in North Allston for Section 8 housing assistance payments; and $288 thousand to the Joseph Smith Community Health Center in North Brighton. And $48 million has also been awarded as a Title I grant to the City of Boston by the U.S. Department of Education. Overall, the non-partisan website reports that the federal government has spent $70 billion and committed another $120 billion to date of the $787 billion stimulus package formally known as the "American Recovery and Reinvestment Act." 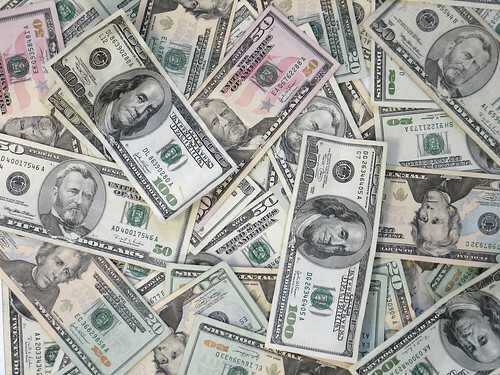 Image of Money! from Tracy O provided through a Creative Commons license. WBUR's Radio Boston program this week is all about owning a dog in the city -- and where you can, and cannot, take your dog, both on- and off-leash. Residents of Allston-Brighton know all-to-well about those issues and the bitter conflicts that can result between dog owners and other park users. Allston's Ringer Park had quite the controversy several years ago between dog owners who wanted to continue having their dogs to run off-leash in the park and those who wanted enforcement of the city ordinance banning off-leash dogs. Readers of the Allston-Brighton TAB saw quite the back-and-forth between the two camps (some examples here, here, here, here, and here), with the former managing to take over control of a park advocacy group from the latter. The police were called in at one point. My occasional visits to the park indicates that the human-dog conflict still exists. Yuck. And on top of that, I heard that an advocacy group for off-leash dog spaces in the city's parks has circulated a questionnaire to this year's candidates for Allston-Brighton District 9 City Councilor, in order to determine if they should endorse any of the candidates. A question about off-leash dog spaces came up in a candidates forum in 2007, which included a response from Mark Ciommo who subsequently won the election. Several years ago, not only did I have a frightened 3-year-old who couldn't navigate through the wild activity of dogs to get to the playground, but I met quite a few other people (adults and senior citizens, in addition to children) who admitted to being literally scared shitless of the off-leash dogs, such that they either walked way around the area where the dogs congregated or avoided using the park altogether. Rogers Park had a dog vs. people problem, too. In fall 2006, I organized a group of neighbors -- both dog owners and non-owners -- to meet a few times about off-leash dogs (as well as a few other park-related issues). All sides of the issues were discussed, including the possibility of creating a "Dog Recreation Space" within the park under the city's recent ordinance. The outcome of those Rogers Park meetings: the dog owners at the meetings pretty much hated the idea of creating a Dog Recreation Space. Why? Many liked the status quo; others thought that some common courtesy on the part of the dog owners, restraining their dogs when people approach, could address most of the problems; and the DRS would have to be paid-for and maintained by the dog owners themselves, which is a significant burden that can run many tens of thousands of dollars. Another idea included installing park benches and moving trash cans in a way that might encourage dog owners to congregate further away from the entry pathways. The neighbors agreed to work for common courtesy, since it didn't cost anything and could address a lot of the human-dog conflicts. The situation improved significant in the first year, although problematical human-dog conflicts still happen periodically. One other thing I learned from the experience: residents who don't own dogs absolutely abhor the term "Dog Park" that is used by some dog owners. There are two reasons: it seems to imply that the off-leash dog activity is legitimate or legal; and the term may act as a magnet for out-of-town dog owners to bring their dogs for off-leash activity. I'm sure this is why the city's ordinance refers to the as "Dog Recreation Spaces", not "Dog Parks". One of the basic problems is that the police do not enforce the city's ordinance. Back when the Boston Municipal Police existed, they occasionally showed up at Rogers Park when somebody called in a complaint, although the response time, according to various neighbors, could take from 30 minutes to a few hours. Enforcement was stronger in Summer 2006 after a child was apparently bit by an off-leash dog near the tennis courts. Since BMP was disbanded, and only some of their officers merged into the Boston Police Department, I have not personally witnessed a police officer in the park enforcing the city's off-leash dog ordinance. Under the new system, police will carry booklets of new citation forms that take minutes to fill out, and include a list of the most common offenses. Police will receive training on how to handle the new citations. It's hard to see that there is much enforcement out there in many of the city's parks, not just Rogers Park. Councilor William Linehan wants to increase fines related to off-leash dog activity, but law enforcement officials recently noted that the problem is "staffing among local and State Police, animal control officers, and park rangers is limited," according to the Boston Globe. More recently, Brookline has rolled out a concept for off-leash dog use in that city's parks, called their "Green Dog Off Leash Program". Some parks have been designated to have off-leash dog hours: mornings until 1 pm in those parks where the dogs don't interfere with other park uses; and mornings until 9 am in parks where the off-leash dogs are too close to the other users. Two parks have more extended hours during the winter. The advantage of the Brookline approach is that no new equipment needs to be installed (except, maybe, for a few signs) so that the cost is minimal. Boston's ordinance for DRS has technical requirements for fencing, trash barrels, a water source, and soil (and its regular replacement), all of which add up to big money. Peters Park in Boston's South End had the first such DRS, and its cost was in the six figures. The problem with adopting Brookline's model to Rogers Park is that most of the Brighton owners who want to let their dogs run off-leash prefer to do so at 4-7 pm -- the time when there are so many other park users. Cambridge and Somerville have both adopted different models, where the city takes the lead in establishing the off-leash dog areas. Cambridge's Fresh Pond site was so popular that city officials blamed dog poop for contaminating the water supply, and banned all out-of-town dogs from the site. Until Boston figures out a practical model either for creating off-leash dog spaces or for enforcing the ban on that activity, the human-dog conflict is certain to continue. In the meantime, might I suggest Oak Square's Hardiman Playground's NE corner for off-leash dog use? It is fenced-in away from the playground entrances and baseball field. 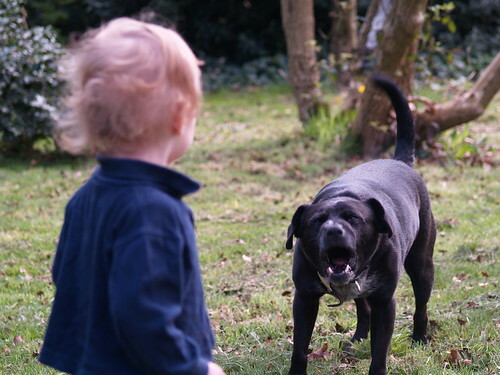 Image of a growling dog from Mr. Dtb provided through a Creative Commons license.